Weave in or cut back? The main decision is whether to cut off all of the new growth or weave it in. Cutting it all off will retain the geometric shape – as you might want to do with a willow hedge, or fedge – to give a thicker weave that eventually grafts together to give a weave of thick mature willow trees. Alternatively weaving in all of the new growth creates more enclosed spaces and a more organic look. These structures will look like a hedge from the outside but will hide a secret world of tunnels and domes. Any rods that are too large to weave can just be cut off at the base and used to replace dead rods or build new structures. Ideally new growth should be woven in as soon as it is long enough – about a foot – at any time of the year, to get it in before it gets too big. Removing the larger growth can also reduce the likelihood of wind damage. Without pruning or weaving in the structure will eventually open up and become a small grove of willow trees. Pruning can be started once the leaves have fallen – usually the beginning of December – and should be finished before the buds start coming out in March. Larger rods can be kept for new structures or replacing dead rods, or they can be dried out for six weeks and used for weaving. Dead Rods – If any rods have died put a new rod in alongside the dead one. The pruned growth from the structure might be long enough for this. Ties – Once the willow gets established the ties may start cutting into the new growth if they haven’t rotted off yet. These ties need to be cut off to avoid them killing the rod or introducing infection, but if the intersecting rods haven’t grafted yet the tie will need to be replaced to maintain the strength of the structure. Aphids and other creepy crawlies – It is very unlikely that anything living on the willow will kill it; apparently the variety of wildlife it supports (200) is only beaten by the oak (284), so you don’t need to worry about things like aphids. If you do want to remove aphids, as they can attract wasps that “milk” their honey dew secretions, you can squash them or hose them off. If you have had a lot of aphids you’ll probably notice a black fungus growing on the willow. This won’t do any harm as it is just growing on the aphid’s sugary secretions. Mulching – To reduce the competition from grass and other plants and help the willow establish keep a one foot strip mulched around the base of the structure. We usually use wood chip which can be purchased very cheaply from a local sawmill, but anything that blocks the light to the grass will do the job: black plastic, cardboard, carpet, woven mulch matting, etc. 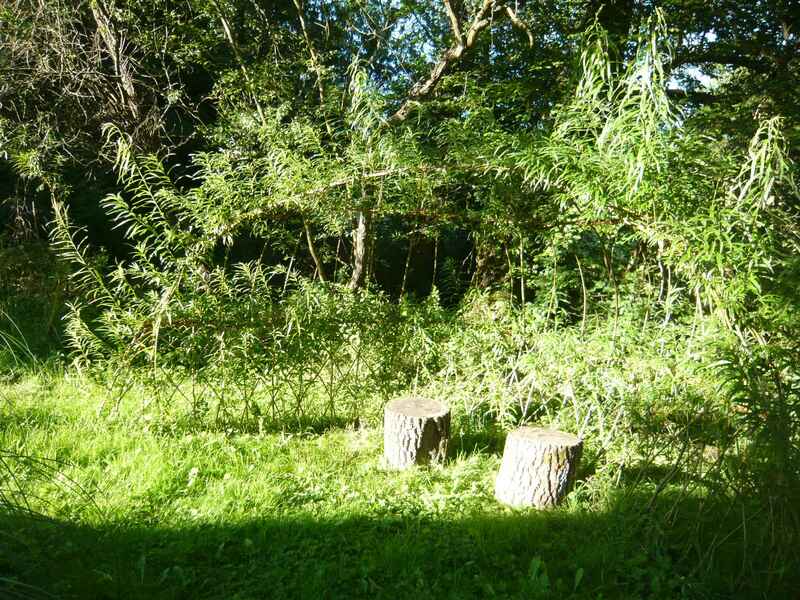 Wildlife Monitoring – As previously mentioned, the variety of wildlife willow supports is only beaten by the oak, so it could be fun to monitor the wildlife that sets up home in the willow as it grows and becomes established. Overhanging Vegetation – Although the willow is pretty tough it does need plenty of light, so make sure any surrounding vegetation doesn’t shade out the willow. Otherwise the structure will distort as it tries to grow toward the light and the growth in shaded areas will slow and it may die. Watering – The willow should only be watered during dry stretches in the spring and summer. You want to encourage it to send down deep roots to find water rather than keeping them near the surface. If you do need to water completely soak the ground around the willow about once a week, rather than watering little and often.